The Alabama Rural Water Association is conducting an Altitude Valve / Tank Maintenance Training Class on the dates and locations listed above. This training covers basic issues of application, selection, and sizing of many types of Automatic Control Valves. It also covers operation and maintenance of Automatic Control Valves to include Pump Control Valves, Pressure Reducing Valves, Pressure Relief Valves, and Altitude Valves. The afternoon session includes basic issues of potable water storage tanks. Inspection issues discussed include: how to select an inspection firm, a review of the applicable industry standards, frequency of inspection, and a list of what to inspect. 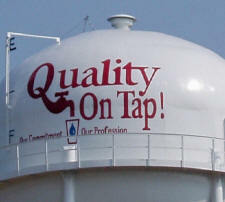 The inspection process should evaluate the safety, sanitary, structural and coating conditions of the storage tank. Routine, periodic and comprehensive inspections will be discussed and, in a workshop, participants will develop their own routine inspection checklist to use for their tanks. This training will be FREE OF CHARGE. 7.0 Water CEH’s subject to ADEM Approval.